When it comes to yard maintenance, handling the hedges can be quite a tricky problem. Not all of us have mastered the art of trimming the hedges in our yard and as a result, they often end up being cut in weird and funny shapes. This inability to cut in stright lines is the main reason people hire professionals to cut and trim the hedges in their yard. What many people don’t realize is the hedge trimmer you use has a big impact on the end result of your work. That makes it highly important for you to find the best hedge trimmer for the job at hand. If you are trying to maintain formal lines or even create uniform pruning lines, a powered hedge trimmer is the tool for the task. This gardening tool enables you to trim the hedges in your garden and thereby enables you to increase its overall appeal. While you can find more in-depth information in the buying guide, the first decision you need to make before you begin to look at individual models of hedge trimmers is what power source it runs on. There are three power sources. Gasoline-powered eaters have a combustion engine to run the trimmer blade. In the electric camp, there are corded and battery-powered. If you had asked me 5 years ago, I would have said battery-powered electric bush trimmers were no more powerful than a toy. In today’s world, things have changed: in general a high-quality, high-voltage battery powered tool is as good as an average gas powered one. Battery powered hedge trimmers are a favorite for their ease of use. To start, you just plug in a charged battery, press a button, and you are on your way. They are also generally lighter than gas-powered models. Another nice feature is the lack of emissions. No longer do you need to breathe in gas fumes while trimming your bushes. While available torque and power used to be a big negative, newer, higher-voltage models equal 2-cycle gas powered trimmers for cutting power. Finally, electric models are quieter than their gas counterparts. On the downside, battery-powered models have a limited run time versus either gas or corded electric models. In addition, not all battery-powered hedge clippers can match the power of similarly-priced gas-powered ones. This is most apparent in the 18 Volt and below power equipment. The newest, higher-volt models are making great strides in this direction. Gas powered hedge trimmers are known for their power, and ability to cut through thicker branches and bushes. There’s a reason most professionals historically use gasoline. In addition, the lack of cords or limited battery power mean you can cover a larger area more efficiently with a gas-powered model. You also don’t need to worry about cutting through the cord as you do when using a corded bush-trimmer. On the downside, gas powered trimmers are loud, give off fumes, and in general are heavier than either of the electric-powered trimmers. They also require maintenance – both during the cutting season and to get ready to put the tool into storage. Neither electric-powered model types have that requirement. Corded-electric powered hedge trimmers are really easy to use. Plug in an extension cord, press the start button and begin shaping your bushes. They are also generally lighter than gas-powered models. Another nice feature is the lack of toxic emissions. You won’t need to breathe in gas fumes while cutting back the growth of your bushes. Finally, electric corded models are usually the least expensive type of tool. On the downside, corded electric models require you to have a long-enough extension cord to reach where you want to work. This makes the category a no-go for many homeowners. The cord can be heavy, which negates some of the weight benefit. It’s also sometimes a pain to keep an eye on the cord so you don’t cut it. This is a real problem with hedge trimmers versus say, weed eaters. Finally, they can be among the least powerful types of trimmers. The EGO 56-Volt Cordless trimmer is our best all-around pick for a variety of reasons. The 56V battery provides enough power to compete with 2 cycle petrol-powered engines, without the hassle of mixing gas+oil, or worrying about ethanol ruining your tool. If you need extra time, 4.0,5.0 whopping 7.5Ah batteries are available for purchase. This would make particular sense if you bought the mower/string trimmers as well so you could interchange the batteries. This trimmer can cut through large branches like butter. It’s rated to handle up to 3/4 thick brush. This should work well for most people. It’s light enough for everyday use at just over 7 pounds without a battery. The 24-inch blade give you extra reach over smaller blades, and the daul-action blade can help shorten the time you spend cutting each hedge. If you don’t already have a compatible battery, either make sure you buy a larger-capacity one on your own or select a kit with a battery and a charger. Nothing’s worse than opening up the box and finding out it didn’t come with a battery kit. This DEWALT trimmer is a great out-of-the-box choice for people with larger yards and ample hedges. For starters, DEWALT is known for a tradition of high-quality products. They back it up with a 90 day money back guarantee, 1 year free service and 3 year warranty. Every manufacturer has some products that fail, but DEWALT makes it easy to rectify if there ever is an issue. The 4.0 amp-hour battery is more than enough for all but the biggest, bushiest yards. Unless you live on a ranch or have A LOT of shrubs to trim, you should be able to get by finishing your trimming without a recharge. You’ll be able to skip the ear protection as well, since this electric-motor is much quieter than a two-cycle engine. This would have been our top overall pick, but smaller-yards don’t really require 4.0Ah of battery. If you consider your yard to be on the larger side, this is a great choice. Not everyone needs the mobility that gasoline or batteries provide. 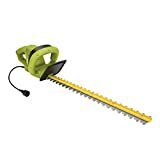 That convenience does come at a cost – so if you have a smaller yard and easy-access to an outdoor power outlet, this Sun Joe brand corded trimmer is a good value. It’s lighter than most other hedge trimmers, and because it only runs a 3.5Amp motor you don’t have to be as concerned about running out and buying a thick extension cord. Any 16-gauge or lower cord should work fine for distances of 150 feet or under. The 3.5Amp motor works well up to 1/4″ diameter branches. You’ll likely stress out the motor if you try to push it much above this limit. For most bushwork, this shouldn’t be a concern. Because it’s electric, you can simply press a button to start the motor – no need to pull a cord like you would with a gasoline-powered trimmer. Not everyone can use this model – if you have a large yard or no easy outlets to plug into, you are out of luck. If you tend to..umm..”space-out” a bit, you’ll need to concentrate more than normal so you don’t accidentally cut through your power cord. It happens with all corded equipment, but PARTICULARLY with hedge trimmers because of the large blade area. The show from cutting through a live wire isn’t the excitement most people are looking for on their weekend afternoons. While I am of the belief that most homeowners can get away with using an electric-powered trimmer and enjoy it, there are some situations that require gas power. A large estate or ranch really isn’t the place to be switching out batteries all day long. For those situations, gas is king. The Husqvarna 18″ is a solid choice when you know you need a gas motor. The double-sided blade will help to cut down on your trimming time. While heavier than almost all battery or corded powered trimmers, this model isn’t particularly heavy for a gas trimmer at ~13 pounds un-fueled. One nice feature of this model is the exhaust is routed out towards the blade – away from your face (and lungs). Do make sure to keep on top of the fuel situation if you have an ethanol/gas blend in your area. The ethanol really plays havoc on some of the engine parts, especially the fuel line. This isn’t a Husqvarna-specific issue, but one that pops up again and again across all 2-cycle products. If you can make sure to not store fuel in the engine for any extended period of time, this will be a fine choice for you. Hedge trimmers aren’t a one-size-fits-all affair. To make sure you are happy with your purchase, you should do a little bit of prep work to discover just what features you need for the trimming in your life. From a safety perspective, the single sided blades are safer than double-sided blades. Tooth extensions protect you from accidently cutting yourself with the sharp teeth on the blades. The off-position lock prevents you from accidently starting the bush trimmer. It is also a safety lock against children trying to start the hedge trimmer. To prevent your hand from slipping and touching the blade, the hedge trimmer has a front-handle shield. With some bush trimmers, the power cuts the moment your hand lifts from the handle. Tip protectors at the top of the blade shield the blade when you accidently bump it against hard objects like rocks. Wrap-around handles. This allows you to hold the shrub trimmer comfortably no matter which angle you are trimming. Lock on switches. A lock on switch lets you continue pruning without having to depress the trigger the whole time. This does raise the risk of injury somewhat. Pigtail cord. This short cord plugs into the cord of the electric bush trimmer preventing unnecessary disconnecting of the cord. Anti-Vibration. This feature reduces the impact on your arms when shearing. Catcher Plate. The catcher plate sweeps away cuttings. When you’re trimming the top of the hedge this feature sweeps the cuttings out of your way. Battery Indicator Light. The indicator light is handy to plan your trimming because you can see how much charge is left in the battery. If you have a large yard,you really are limited to either a battery-powered or gasoline-fueled trimmer. Your maximum reach will be about 150 feet from an outlet in ideal conditions – and most people don’t have ideal conditions at their home. The larger your yard and the more bushes you have that need work, the more likely it is you’ll need to go with gas. Higher voltage equipment – say 40-volts and up – can compete with the power of 2-cycle engines, but you will need to pay attention to how many Amp-hours (Ah) you have available at your disposal. The higher that number, the longer you can run without having to wait for a recharge. The distance of the blade gap between the teeth determines the capacity of the hedge trimmer. The wider the gap the tougher branches it cuts. Most hedge trimmer blade gaps are less than an inch (3/8 to ¾ inch). 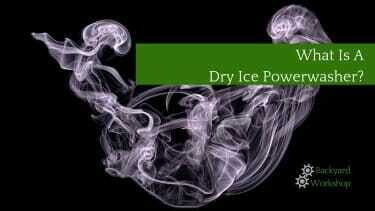 Single sided blades cut in one direction and therefore easier to safely keep the blades away from your body. Double sided blades cut efficiently but cut in both directions. 16 inches for small hedges and shrubs. 18 inches for the larger but average shrub. 20 inches for established hedges and large hedges. Gas hedge trimmers weigh about 10 pounds. This makes it tough to use for tall hedges even though it has a longer blade. With long reach bush trimmers, you can easily prune hedges as high as 12 feet. The shrub trimmer has extended shafts to help prune those out of reach hedges without needing a ladder. The weight is at the end of the shaft and can cause tiredness sooner than a normal hedge trimmer. When using an extension shaft, you can’t see where you are trimming. A hedge trimmer with a rotating head conveniently cuts horizontally and vertically. Cost always comes into play with every purchase. In general, you get what you pay for. Corded electric tools are usually cheaper because of the lack of batteries or internal-combustion engines. You should factor in the costs of an extension cord if you need one though. If you are only cutting one bush, it might not matter just how high-quality or well built your trimmer is – you’ll barely be spending any time using it. On the other hand, the more time you spend outdoors trimming, the more you’ll want to make sure the tool both works well and is comfortable. Gas bush trimmers are the noisiest of the hedge trimmers. Gas hedge trimmers can reach a noise level of 97 decibels, which is double the db level of what an electric bush trimmer makes. Since sound is measured on a log scale, that level of decibel difference means they can be up to 30x as loud! Wear hearing protection while shearing with any hedge trimmer. Battery shrub trimmers make the least noise. There is no need for me to have hedge trimmers but if i do, i’d choose the battery powered. It says above it is quiet an I really dont like something to disturb my neighbors since I like gardening in the morning. I bought an EGO 56 volt battery hedge trimmer and I am really impressed by its power and quality of cut. It will trim for 30 to 40 minutes per charge, enough for me to trim all my hedges. This is a very great and useful review. I’d really appreciate it, if you could probably make additional reviews about how easy to find the replacement blades for each product. We just moved into a great new suburban house in a quiet neighborhood. The only problem was, we had an overgrown hedge that probably wasn’t trimmed for years! This article made looking for the best hedge trimmer for us so much easier. The GreenWorks 22272 G-MAX looks like a potential buy. I will always prefer the battery powered trimmer over the corded one. Though it won’t last long in one charge, I think the battery powered trimmer is less dangerous than the corded trimmer. I completely agree with you. Also, the battery powered one allows you to move around more freely than the corded trimmer. To maintain a yard you gotta pick your right tools, excellent article. Easier to see how this could work or which of the models works best for you. For me it would be a battery powered hedge trimmer as I don’t need much and the operation is quiet as I would like to do my yard early morning. The BLACK+DECKER LHT2220 22-Inch could work for me, the lithium battery seems so attractive but it must be expensive, anyways the battery lifespan may be worth it as I like to work my whole yard in one try not wait to recharge. Thanks for this article very informative and to the point! I have always wondered how the hedges are trimmed and some even have various shapes. Hedge trimmers have varieties as well, from gas, to power outlet powered, lightweight, double insulation… If I didn’t have “warm hands” with plants, maybe I could have considered gardening and have plenty of stock of different hedge trimmers. When it comes to hedge trimming, the more powerful the tool I use, the better and faster the results I usually get. Battery-powered ones just don’t have enough juice to got through thick branches. Corded ones annoyingly limit mobility, plus the danger of accidentally hitting them wires. The gas-powered ones are noisy and heavy, but they get the job done the way I expect them to. I used to marvel the work of my neighbor’s gardener whenever he’s done trimming their hedges. He only uses them huge scissor-like thingies and something that looks like a jungle knife. I wonder if I can match his work using one of the babies in this post! I own a corded hedge trimmer from Gardenia. It is suitable for the purpose of trimming/cutting hedges in front of the house. It is actually efficient and does what it is supposed to do. I would always go for gas powered trimmers. All things considered, it’s the most powerful and most efficient of all the types. The Tanaka TCH22ECP2 looks like a good replacement choice when my current bad boy retires. Had it for almost 10 years now. Hedge trimmer – there is an art on this while you do the work. Not everyone can do this job. Trying myself so long BUT not success. 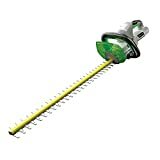 These products are excellent, can do the job very easily to really avoid if you have kids and they play on garden all your plants going to hurt them, with this tool you can trim them as well good looking garden, kids will like them, and they do sports at your garden once you trim them with these tools. The place where I live is short of power supply. So, the best kind of hedge trimmer for my garden seems to be the one which used gas as the power source. Besides, it gives the freedom to use it for heavy work too. I am very undecisive when it comes to my gardening. I would go for one looking as badass as number 7 but I need something not as noisy because I live in a neighborhood where people complain at the slightest sound. Anyway if you want something useful as a trimmer I would go for number 5. Thanks ! So true, we can never master the art of cutting hedges. But with this amazing tool, hedges watch out. Thanks for this page, another way to learn about hedge trimmer. I didn’t know this can be so easy. I’m not sure corded hedge trimmers…they’re an accident waiting to happen! I don’t usually plug equipment that I use outside the house. It’s an open environment and anything can happen like, literally anything! So, I’d rather go with battery-operated ones. Gas-powered trimmers are bulky and heavy. That Greenworks Li-Ion Pole Hedge Trimmer will work for me. I don’t need a powerful trimmer and another factor is the weight. The design is another plus. It looks very nice! When my brother asked for a hedge trimmer as a housewarming gift, I didn’t realize there were so many things to consider. From grip to noise level, I really have my work cut out for me. Thanks for this informative article and for the pros and cons you listed. Now, I have an easier time choosing the right one to buy. I think I’ll choose something that is lightweight. Most of the time I don’t have my husband with me to do the trimming. It would be easier for me to carry around the trimmer if it’s not heavy. I won’t dispute Black+Decker’s top spot on this list. They’re really the best out there. But lemme be clear: we don’t do our hedge trimming, we pay somebody to do it. He uses Black+Decker and we are very satisfied with the result! I have a Bosch hedge trimmer and is adequate for my hedges which are not a lot btw. If your garden is small and you have the physical stamina to do work such as trimming and mowing, invest in machines such as a hedge trimmer. It will save you lots of money rather than paying someone to do it unless you are in a place where hedge cutting is not that expensive. Personally, after paying 500 euros for 3 hours to clean up a tiny, tiny garden, it was not worth the cost and from then on, I got a hedge trimmer and did the work myself. The pros & cons charts are laid out perfectly. I site is the best I’ve seen in its class so far. I think I will buy my hubby this for Christmas. Would make a great gift! I just love the sharp groomed look of a lawn – and there’s nothing that gives that pristine look like hedge trimmers and edgers. I’m definitely in the market for this so appreciate the info and tips! Ahh so this is why my father said to look for times of hedge trimmer. And this also explains why when I went to the hardware the other day they asked me what exactly do I need to use it for. Haha, very informative. Thank you. I think I have quite an idea on what I need now specifically. “The high performance capacity of the machine is one of the main reasons why many professionals use this particular model.” What I think that, if the equipment has more functionality, then more people might use it. I prefer cordless or battery-powered outdoor equipment. We don’t have a hedge trimmer, but we plan to buy one. I reckon any of the Black+Decker on “cordless” list will do. It’s a good brand. We have a gardener that maintains our lawn, he comes in about twice a month. I noticed he uses DeWalt. Must be a good brand! He uses a gas-powered trimmer. Bit noisy, but it does the job well! 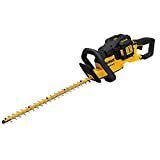 I like the DEWALT DCHT820P1 20 V Max Hedge Trimmer with 5AH Pack. I think it will be fun to cut things with that equipment. And it’s affordable too! I always love reading your reviews! They are all very handy and easy to read. This hedge trimmer review in particular, has made my chore to buy a new trimmer so much easier! I know nothing much about hedge trimmers. If i were to choose i would go for the one that has a good grip and twice the battery life. We have a mini garden in our house and i am just trying to familiarize myself with the tools. This is very helpful and interesting. I can’t stand gas powered hedge trimmers because they’re so noisy. I have a baby at home so gas powered ones are a no-no for me. I personally prefer a battery powered hedge trimmer because it’s more convenient and relatively noise-free. Great review! I love to keep my bushes trimmed and yard looking beautiful. I will take a closer look at the lightweight models because that looks like something that won’t make my arm fall off lol.. I like that Poulan Pro PP2822 22-Inch 28cc 2 Cycle Gas Powered. This looks like a good choice and has some good reviews on Amazon. Good battery like is the most important for me when it comes to cordless hedge trimmer. So when you mentioned that BLACK+DECKER LHT2220 has double the battery life, that got me right there. Not to mention that Black & Decker is a top brand with a sound reputation. Can’t really go wrong with them. I think I will go for the corded hedge trimmer due to unlimited power supply. I don’t have time to worry about power going out with the volume of jobs I have to complete. It is almost impossible to get the ideal hedge trimmer. Gas hedge trimmer has high power but it is too heavy and noisy. Battery powered trimmer on the other hand, is less noisy and rather light, but it has lower performance. All of them have specific cons. They’re not perfect but I think all of them would work just fine. Thank you for this article. Very helpful for people who wants to buy hedge trimmer. This is a very useful guide for those who are planning to buy a hedge trimmer. Light, noiseless hedge trimmers sound especially good to me. Wow! What a great article for hedge trimmers! I’m going to forward this to my hubby, he’s been shopping around for one! I don’t have a garden but i would pick the battery operated trimmer. Aside from other benefits, it should be last a long time, this toll is quite expensive. I usually look at the customer’s review every time I purchase something online. I’ve been itching to get a hedge trimmer. Thanks to this thorough guide, I’m ready to make the purchase! Wow, I love how these trimmers look. I’m a little concerned about their quality, though. They are cute, but don’t look durable! Does anyone know how long these guys last? Quick question, What is a hedge I mean in plant terms? I will be honest here unless I do some research on what a hedge is in whatever context it is used here only then can I give my evaluation. I am just being honest guys so kindly enlighten me about what that is. Any feedback I will greatly appreciate it.